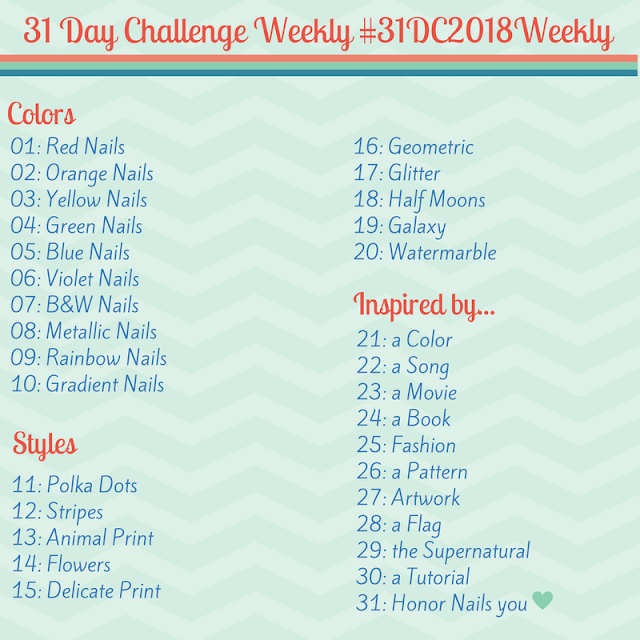 Road to Polish Con - Week 6 (Leesha's Lacquer, Supernatural Lacquer, Scofflaw Varnish) - Polish Etc. It's that time of the week again! 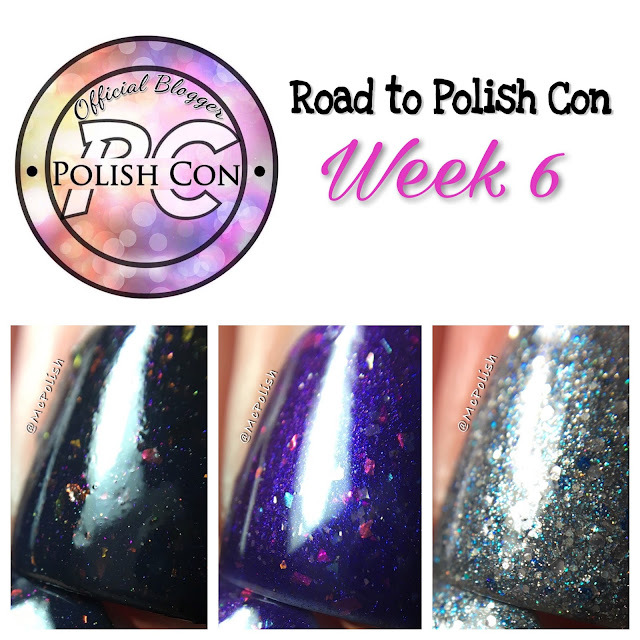 We get to take a look at what the Road to Polish Con series has to offer up for next week. Right now, you can still get Week 5 polishes until the end of day on Saturday. But starting on Sunday, you will be able to purchase three new polishes from three fun indie brands participating in this fall's Polish Convention. For Week 6, we have exclusive shades from Leesha's Lacquer, Supernatural Lacquer and Scofflaw Varnish. Let's take a look! 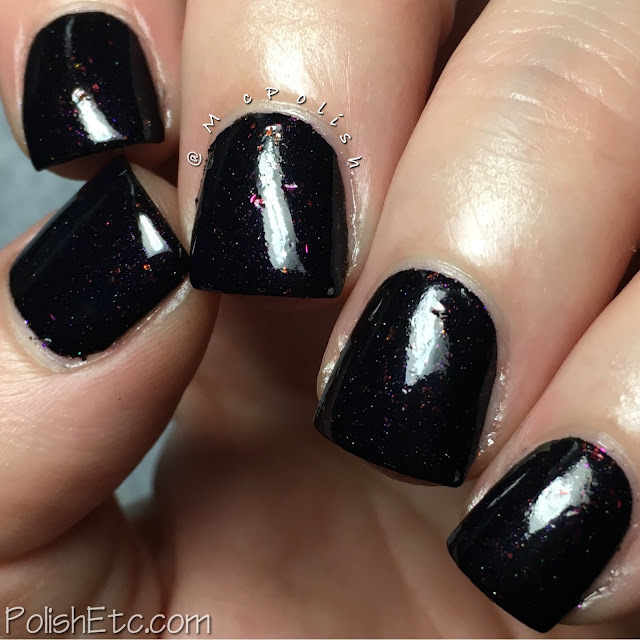 Pier Pressure by Leesha's Lacquer - A black creme with faint purple and holographic microshimmer and orange/pink metallic flakies. This polish is super opaque! The black base is opaque in just one coat. This does make the shimmer and flakies much more subtle. I did two coats for this swatch to see it the flakies peeked through a little better with a second coat but it looked exactly the same as one coat. A glossy top coat is recommended to smooth everything out. 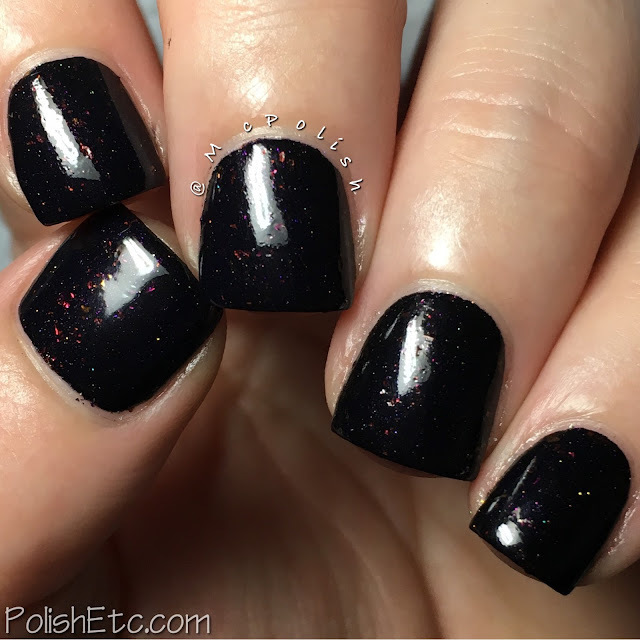 Funhouse by Supernatural Lacquer - A deep purple jelly base with shifting shimmer and a sprinkling of orange/pink/gold flakies. 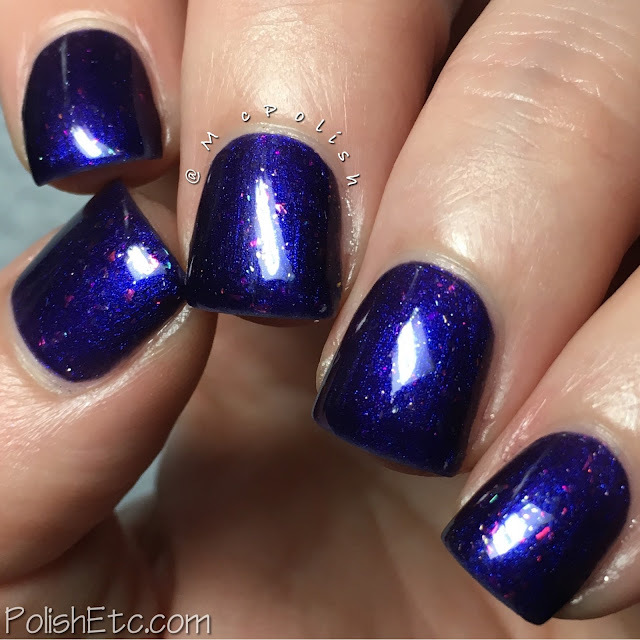 The fine shimmer in this polish will shift from blue to purple to copper at an angle. The base is pretty opaque for a more jelly consistency. I was able to get it opaque enough for my liking in two thicker coats but some people my prefer three thinner coats. Top it off with a glossy top coat to smooth it all out. Charlotte Spinning in the Stars by Scofflaw Varnish - A steel grey crelly with mix of sliver, grey, black and navy glitters as well as a aqua/blue shimmer. This polish looks grey most of the time but then gives of flashes of blue and green in different lighting. I dig it, of course, I love grey polishes. The formula was a little on the thick side with all of the glitter and shimmer in it. But it applied smoothly. I am showing you two coats with glossy top coat here. So, what do you think of the Week 6 exclusives? This pairing has more a wintry feel rather than fall shades. All of the Road to Polish Con colors are available for $10 each. There several shipping options available to suit your purchasing style (gotta have them now! vs. waiting for one big package). You will be able to purchase these three polishes from The Polish Convention site from 8/6 - 8/12 only. Be sure to check back here each Thursday for a look at the upcoming week's exclusives!